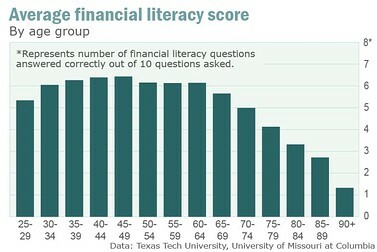 A very interesting study out of Texas Tech University asks the question: How is Financial Literacy Affected By Age? The results are very interesting. Even though the paper reports that households with ages over 60 years possess more than half of the wealth in the United States, a decidedly younger crowd, the 45-49 year olds, possess the most financial knowledge. The implication: while we know that there is a decline in physical and cognitive capabilities which comes with aging, we should also note that with those cognitive changes may come with curious financial decisions as well. That said, with this study in hand we can estimate your peak financial years. Many Americans find themselves in a situation where they are taking care of aging parents and grandparents. At the same time, it seems that more financial predators target their schemes towards the older crowd. The idea of scam artists finding their marks usually ends with a description of a “little old lady” who was taken for a ride by a dubious character. This stereotype comes with a hefty serving of truth: while financial prowess declines with aging, financial skills among the females in this study were worse than those of the males. To pick one statistic: while males scored 50.64% on the investment section of the quiz, females clocked in with only 36.59%. Some of this may be traditional gender roles current members of the Silent and Greatest Generation were raised with, but take note. Granny may be sharp as a tack, but her confidence may be covering up a lack of sophistication in financial matters. All in, financial literacy in the study declined at a whopping 2% every year after age 60. While a 70-74 year old can generally match financial wits with the 25-29 year old crowd, skills erode quickly from that point. So there you have it, cognitive decline is a slow process, but 45-49 are probably (or going to be? were?) your peak financial years. That should also be the time when you’re at your peak earning period, thus able to save the most for retirement and such. I did some IT work for a financial planning firm many years back, and they had a progression of building wealth, and this time period was known as ‘Rapid Accumulation’ if I remember correctly. You’re 100% right. I have an article sitting in my drafts that makes the point more explicitly (especially as it relates to taxes paid), but the late 30s – early 50s is the highest earning period of a career. More to the point – the late 40s is the peak. It’s an important point to make because you can usually earn your way out of mistakes earlier in your career. Late 40s? Much harder to do. Thanks for stopping by! I have to agree with Joe @ Retire by 40: I’m not so sure the “older” demographic is always so careful with their money. Maybe it’s just the area I live in… but it seems like there are a lot of “house-poor” adults age 45-49, and they’re really scraping by following the economic slide. Cool stats, though – great post! I agree with what you said above: it’s harder to earn your way out of your mistakes in your late 40’s. It’s still doable… but a lot harder! Yes, but I hope no 20-somethings take that as an excuse to spend wildly, haha! I’m just saying… if you have to pick an age where you will “make more in the future”, pick 25. Thanks for stopping by! I find that older folks are not as careful with money. Maybe they just want to enjoy spending what they have (within reason) and not saving it for later anymore. The whole spending down thing is going to be a challenge after accumulating for so long… I wouldn’t blame anyone if that’s how they played it, heh. I agree with RB40. I myself watched people to retire early not because they can afford it but because they are tired of working, don’t like their bosses and just want to move on with their lives. As far as the statistics showing that women fare worse than men of the same age when it comes to financial literacy, I think that the disparities will even out as time progresses and “gender roles” evolve. However, the stats do show that there is a strong need for the older generation to have financial advocates, so to speak. Especially, women that have recently been widowed, and used to having their husband deal with the finances. This is a common occurrence simply based on women’s longer life expectancy. I really enjoyed reading this post, and I’ll be referring to it during my multi-post series on financial literacy. Aloysa – if you’ve got the means, there’s no harm in retiring early. One of my concerns is the opportunity costs of retiring in what Money Beagle called the Rapid Accumulation stage. You’re leaving a lot of money on the table, money that won’t be there if you have to reenter the work force (I know, another article!). Kamara – The most dangerous words from that generation are ‘My husband always handled that stuff’. Anecdotally, that was the case for many of the older ladies I know. Considering that women do generally live longer than men it’s a huge concern… I’m hoping that the Boomers have flipped the script and spread the responsibilities a little more. You might be leaving a lot of money by retiring early but on the flip side with proper savings, you get to enjoy life while you still have your health. Additionally, there is always the choice of going into semi retirement so that you still have some income coming in minus the 40 hour work week. Also a good point – maybe I should do a post on the backwards bending labor curve at some point. I know that’s based on income, but it would also apply to the marginal utility of work during your 40s. Thanks for the comment! I wonder how much the age of financial literacy has to do with the “interest” levels… often out of necessity. I would think the need to consider so much related to finances at that age drives the learning curve. Yeah, maybe it has to do with the interplay of incomes vs. wealth (can you think of some incentive which is stronger with income than wealth?). The 40s crowd owns the incomes, but the 60+ crowd owns the wealth, so there is something going on here. Interesting topic. A lot of that might indeed be due to previous lack of information on financial concepts, and traditional gender roles where in generations past the man took the lead with earning and money decisions. I would think – hope, anyway – that this gap will be closed as these days over 50% of undergrad and grad degrees are earned by females. All of this speaks to the importance of continuing education and making learning/keeping one’s mind sharp a priority. Another point is that some of the financial innovations (401(k) for one) that we’ve seen recently weren’t around for the Silent and Greatest generations. I do expect to see that gender gap close – but there is certainly no shortage of people of both genders who can’t figure things out financially even now.